… full of diamonds and monsters, bats and little androgynous block figures. To get this running on a server under my stairs took a little bit of network and computer building, not the least of which was cobbling together a machine from bits of scrap computer parts. 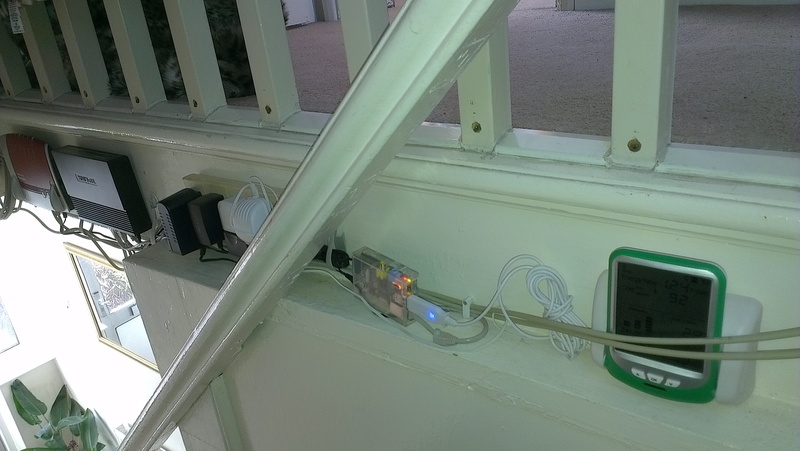 It’s resulted in a multiple mess of computers, networks, VPNs (virtual private networks) and lots of computer kit wired on the side of my stairs. Fun, fun, fun. First off was the machine. An old case from a friend was used with a ‘spare’ motherboard, and a dual-core CPU of which I have a few lying around. Then the OS was loaded by putting Ubuntu onto it, and Apache loaded with the administration software called Multicraft which allows us to control it from a distance. Then the network presented problems, so I hard-wired it into my local network to bring the total number of unique ids to approx 40 machines with independent addresses. A little crazy but necessary for the Internet of Things (or as one friend put it, “I’ve reserved a IP6 network address for every molecule in my house”). After a while we automated it totally so that startup would be automatic including switching on the machine, starting the OS, and starting the servers which would allow connection from my son’s gaming ‘clan’ into it. So far they have had a ball building virtual houses and roller coasters, along with a few spats about some ‘griefing’ between players. He connects remotely using a encrypted tunnel and I think the whole thing has taught us both a little more about computers!